Halifax-based, JUNO-award-winning singer-songwriter, Meaghan Smith’s latest project, Our Song – an opportunity for her music fans to have their stories told in song – just released new song “The One” today, September 1st, 2017 at oursongmusic.com. With a new song unveiled the first Friday of every month, Our Song was a concept created earlier this year in collaboration with multi-instrumentalist / music producer, Jason Mingo, who Smith affectively calls her HusBand. “Our Song is a way for me to be with my fans and intermingle my life with theirs,” said Smith. “In the past it was all them hearing my stories, but Our Song is a chance for me to hear their stories, write their songs, and share them with even more people.” Following the highly successful commercial and critical success of Smith’s album, Have A Heart (2014), Smith needed to make a change to her musical life. Things were changing on the home front, and going out on tour, as a major label artist no longer resonated with her. She still wanted the connection that making music provides but after a life-altering experience, she wondered whether she was alone in what she was feeling. The more she thought about it, the more she wondered whether she could find the connection she craved more directly – and Our Song was born. “I feel like I’ve been through some things in my life and I’ve arrived at this point where I’m done being in my own life by myself,” said Smith. “I want to be with other people. In the past, when I’ve released my own music, I’ve been inviting people to come into my stories. But I want to turn it around, and be invited into other people’s stories.” The Our Song process works like this: Fans get in touch with Smith and tell her about the song they’d like to have written. She sends them “an extensive list of questions” by email, and follows up with a phone call to really get into the nitty gritty of the story they have to tell. And then, if she feels she can do their song justice, she gets to work writing it. For the agreed upon commissioned fee, the patron ends up with a professionally recorded and produced track, along with a letter from Smith detailing her process in writing the song, and an illustrated lyric sheet suitable for framing, all wrapped up in a gift box. Smith retains the rights to the song and makes it available for sale on iTunes, and may license it for placement in television shows or movies. “The process takes weeks and sometimes months to get a song just right, from the conception of the idea, to working out the melody and lyrics, to the actual arrangement and production. Our Song gives my fans the opportunity to see and understand what goes into the songs they love,” added Smith. “The One” is the fifth song in the Our Song catalogue. The song was commissioned by a woman named Alecia from London, Ontario for her sister, Shayna who was getting married. “Alecia told me a little bit about Shayna: she had a big heart and had been looking for ‘the one’ for a long time. She had been through some really tough break-ups in the past and had struggled to find the one. Finally, she met Travis, an amazing father of two beautiful children. They became good friends and after getting to know each other they fell in love. I wanted to write a song to reflect that one moment in time, the moment when you know you know. I have experienced that in my life. There’s nothing like it,” described Smith. See the lyric video for the song here: TheOne and to download the song, visit:TheOne. To commission your song, visit: oursongmusic.com. Born in London Ontario, Smith has released two albums: The Cricket’s Orchestra(Independent, 2007) and Have A Heart (Warner, 2014). Smith won a JUNO in 2011 for Best New Artist along with two East Coast Music Awards, including Best Pop Recording(2011) and Video of the Year for “Have A Heart” in 2015. Smith has shared the stage with k.d. lang, Sarah McLachlan, Tracy Chapman and Ron Sexsmith and has had music placed in popular TV shows, Brothers & Sisters (ABC), Grey’s Anatomy (ABC), One Tree Hill(CW), Astronaut Wives Club (ABC) and Working The Angles (NBC). 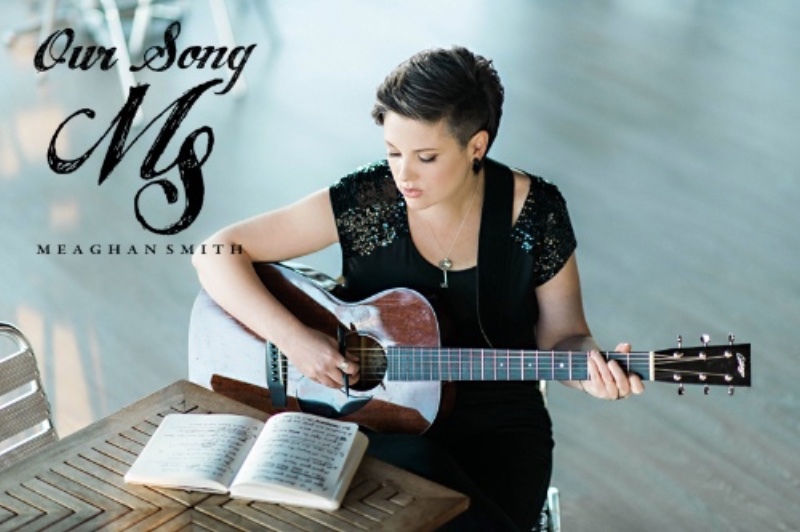 For more information on Meaghan Smith and #OurSong, visit: meaghansmith.com, like Facebook: meaghansmith follow on Twitter: meaghansmith, Instagram: themeaghansmithand YouTube: meaghansmithmusic.